And other priorities to expand resources available for state and local governments and to advance prevention and treatment. 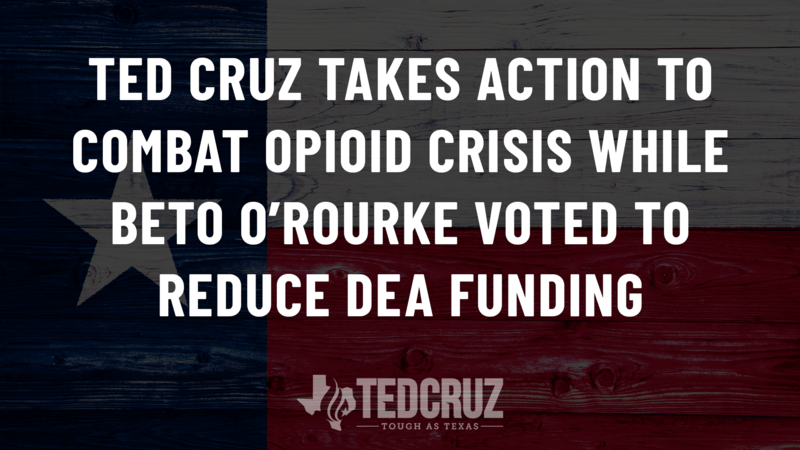 As one of the millions of Americans who have lost a loved one to drug addiction, Sen. Cruz understands the importance of shining a light on this destructive epidemic and taking action to combat it. In contrast, his opponent, Beto O’Rourke has a troubling record of failing to support efforts that would counter drug trafficking operations to protect U.S. and Texas communities. He has previously voted to take funding away from the Drug Enforcement Agency (DEA) and voted against NDAA funding to stop counter-narcotics operations in Afghanistan. In 2014, O’Rourke cast a vote in favor of an amendment to the FY 2015 Commerce-Justice-Science Appropriations Bill that would have reduced DEA funding by$18 million. Additionally, in June 2016, O’Rourke voted for an amendment to ban the use of NDAA funding for counter-narcotic operations in Afghanistan. Afghanistan provides 90 percent of the world’s heroin, and poppy harvests increased by 43 percent in the country last year. More than 72,000 Americans died of drug overdoses last year. Law enforcement agencies are working overtime to protect American citizens from the scourge of drugs coming across the 1,254 mile Texas-Mexico border, much of which remains unsecure and extensively exploited by drug trafficking organizations to smuggle illicit drugs into the United States. For more information on Sen. Cruz’s proven record defending Texas values, please visit www.TedCruz.org.